While it is possible to have both MPLAB® IDE 8 and MPLAB X IDE installed on the same Windows® based system, they use different USB drivers to communicate with our tools. MPLAB X IDE uses Microsoft's generic WinUSB driver while MPLAB 8 and earlier uses a set of proprietary drivers. As such, if you wish to use both versions of MPLAB on the same system (for example, to support legacy code in its original environment), you will have to switch USB drivers each time you move between MPLAB versions. 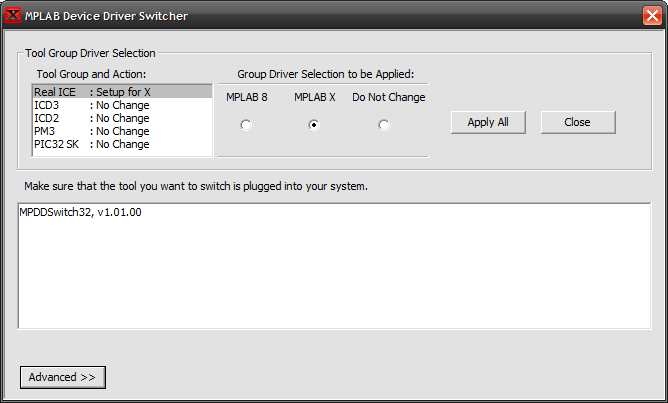 There are two methods you can use for switching drivers: a switcher utility program that is installed with MPLAB or manually using the Windows built-in driver maintenance process. Drivers are switched on a per serial number basis which means that a different driver may be associated with every tool connected to the system. For example, if you have two ICD3s, you must switch the driver for each of them if you wish to use them both in MPLAB X. In other words, you must switch the driver for all tools in the family to use all of them in MPLAB X. This was done so that you could have one ICD3 with the old driver connected to MPLAB 8 and one ICD3 with the new driver connected to MPLAB X and have the two IDEs running simultaneously. The same holds true for the other tools except for the PICKit 2 and 3 which use the standard Human Interface driver found on all systems. Ensure that the tool of interest is already connected to your PC via a USB cable. If you run the switcher without the tool connected, the driver will not be switched. Select the tool whose driver you wish to switch under "Tool Group and Action" and the driver you wish to use under "Group Driver Selection to be Applied". Do this for each tool you wish to switch. Then click on the "Apply All" button. 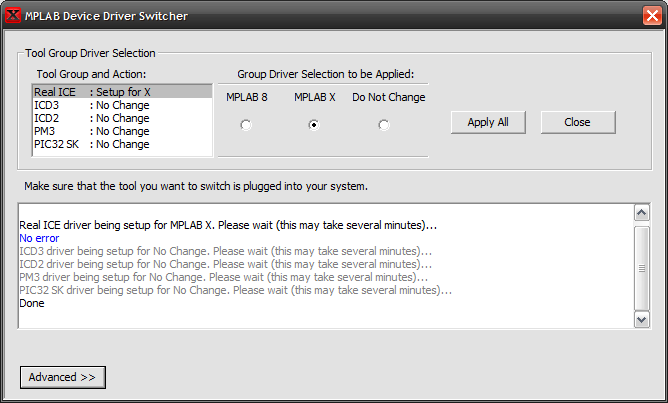 MPLAB 8 will switch the driver to the MPLAB 8 driver no matter which one is currently being used. 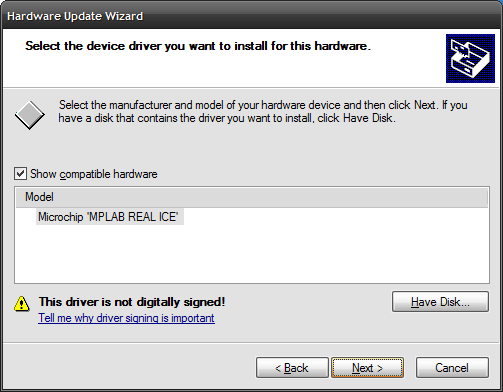 MPLAB X will switch the driver to the MPLAB X driver no matter which one is currently being used. No Change will leave in place whichever driver is currently being used. No change will be made. If you installed MPLAB X in a non-default location, you may need to click on the Advanced » button and specify the locations of the *.inf files. It may take a minute or more to switch the drivers. In the end, you should see "no error" in the text box for each driver you switched. 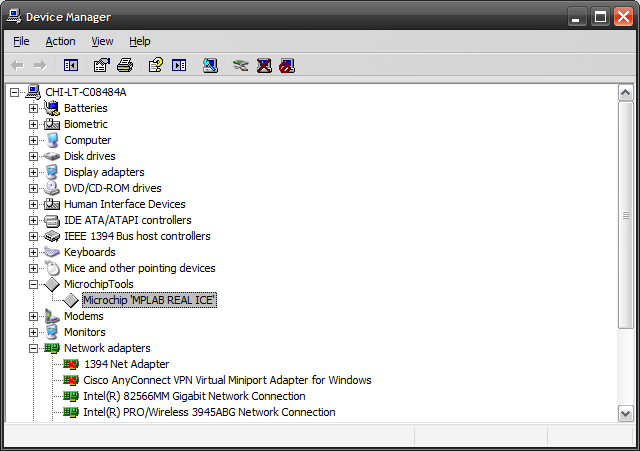 Open the device manager and select the MicrochipTools category. Right click on My Computer and select Properties from the pop-up menu OR run System from the control panel. Expand the MicrochipTools category by clicking on the + on its left. 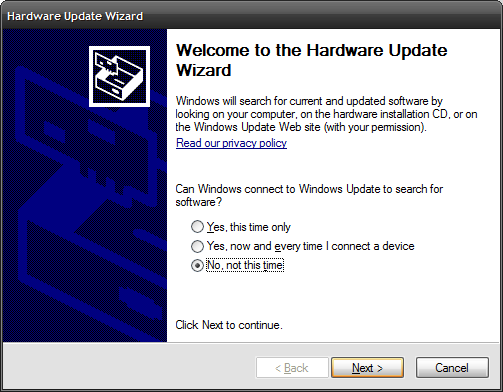 Right click on the entry under MicrochipTools that represents the tool whose driver you wish to change and select Update Driver… from the pop-up menu. 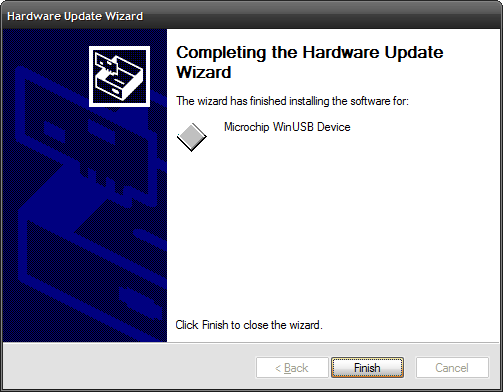 If you are switching from MPLAB 8 to MPLAB X, you will see Microchip <tool name>. 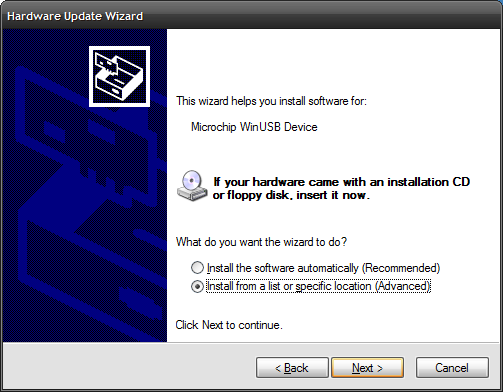 If you are switching from MPLAB X to MPLAB 8, you will see Microchip WinUSB Device (regardless of which USB tool you are using). Please choose your search and installation options. Select the SECOND radio button. Don't search. I will choose the driver to install. If you choose the wrong radio button in this step, the driver switch will fail without any notification. Select the device driver you want to install for this hardware. Once the desired driver is in the list, select it (if there are more than one) and click on the Next button. The final window should now show the driver currently installed. Click the Finish button to complete the process.